Need some serial ports in your B&W G3 or G4 computer? Orange Micro's exclusive "plus" series Grapplers have been designed to save your PCI slots by putting multiple functions on a single card, and to save costs for the user. The Grappler+ adds the most common functions required by Macintosh G3/G4 owners - Fast SCSI and 2 Serial Ports. No need to buy new USB peripherals - just use your existing serial and SCSI peripherals and save money. Many of the "Blue" G3 and G4 customers are looking for an inexpensive way to hook up their existing, slower SCSI devices such as scanner and Zip drives to their G3. 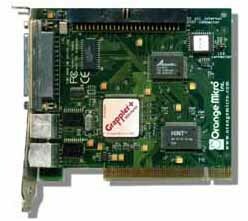 The Grappler is a Fast SCSI-2 device. It is double the speed of original SCSI. SCSI is 50 pin Internal and 25 pin external and is SCSI device system bootable. 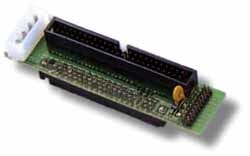 Serial Port Features: Two serial ports (RS-422); mini Din-8 connector. Supports serial printers, Palm organizers, modems, digital cameras, Apple Personal ImageWriters, and most other serial devices. Does not support AppleTalk or GeoPort. Tested Good Used. Our $34.77 price includes domestic shipping. 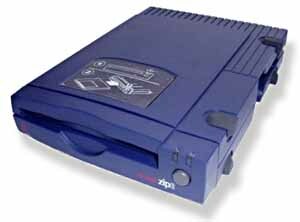 SCSI Iomega Zip 100MB External Drive for PCs & Macs, w/SCSI cable, Power Adapter included. READS AND WRITES 100 MB Zip Disks. These are tested reburbished units. Our $79.77 price includes domestic shipping. Want your system to be faster? Hook this PCI card to an UltraWide 68 Pin SCSI drive and watch the files fly at 40 MB/sec. data-transfer rates! A regular drive sysinfo run about 480, with an UW it runs over 660! Also works well with your older 50 Pin drives. Just add a 50 Pin adapter. Not tested with OSX. Was $49.77 Your price $24.77 Free Shipping! Buy one of these and an UW drive and we will throw in a UW SCSI cable on your phone order. Works in the G5 and G5 Servers. 64 Bit PCI-X SCSI Card provides 160 mb/sec. data-transfer rates. OTHER FEATURES: Cyclical redundancy checks. Double transition clocking. Exclusive adst technology. Supports up to 30 scsi device ids -15 each externally and internally. Up to 12 meter cable lengths. Connect legacy and ultra3 devices. One (1) external vhdci and one (1) internal high-density 68-pin connector. Compatible with scsi-3 scsi-2 and scsi-1 devices. Low voltage differential (lvd) single-ended signaling. Bus mastering capability. Support for tagged command queuing. Backward compatible with ultra2 ultra/wide fast/wide and narrow scsi devices. Large command fifo. Asynchronous i/o support. Bootable from attached disks. Support for disconnect/ reconnect. Support for multiple block sizes. Legacy device support for Mac users. Automatic termination. USED PULL, cleaned and tested. OSX Compatible. Our $199 price includes domestic shipping. SCSI Pass Thru Terminator - Premium Quality! Passive, 50 pin flow through design terminator for SCSI chains. Regular $19.95 Our Price $12.77 includes shipping! 50 pin SCSI Terminator - Premium Quality! 50 pin terminator for SCSI chains Regularly $14.95 Our Price $9.77 includes shipping! 25 pin SCSI Terminator - Premium Quality! 3' 50 to 50 pin SCSI Cable - Premium Quality! 50 to 50 pin SCSI Cable Regular $35.99 Our Price $14.77 includes shipping. 2' 50 to 50 pin SCSI Cable - Premium Quality! 50 to 50 pin SCSI Cable Regular $ 29.99 Our Price $12.77 includes shipping. 2' 25 to 50 pin SCSI Cable - Premium Quality! 25 to 50 pin SCSI Cable Regular $ 29.99 Our Price $12.77 includes shipping. 3' 25 to 50 pin SCSI Cable - Premium Quality! 25 to 50 pin SCSI Cable Regular $35.99 Our Price $14.77 includes shipping. 3' 25 to 25 pin SCSI Cable - Premium Quality! 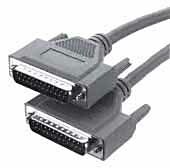 25 to 25 pin SCSI Cable Regular $ 29.99 Our Price $10.77 includes shipping. 2' 25 to 25 pin SCSI Cable - Premium Quality! 50 to 68 pin SCSI Adapter - Premium Quality! 50 to 68 pin SCSI Adapter. This lets you install a 68 Pin Hard Drive into a system that only has 50 Pin Internal Cables. Style may vary from picture. Regular $39.99 Our Price $18.77 includes shipping. SCA to 50 Pin SCSI Adapter - Premium Quality! SCA to 50 Pin SCSI Adapter. If you find a good buy on an 80 pin SCA SCSI drive you can use this adapter to make it fit your regular 50 pin Mac systems - Regular $39.99 Our Price $29.77 includes shipping. HDI-30 to Centronics-50 SCSI Cable for PowerBooks 2' (used) Retail value $39.95 Our price $19.77 includes shipping! 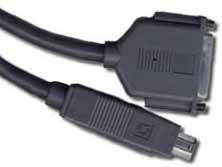 HDI-30 to DB-25 SCSI Cable for PowerBooks 2' Retail value $39.95 Our price $19.77 includes shipping!